Pools are not just part of the decor that elevate the aesthetic appeal of a home, they’re great for leisure, keeping fit, parties and what not. It’s why many prospective homeowners have it on their checklist, and those who do have it already make it a priority to have the pool amply cared for. But this priority is almost always too demanding: First, gallons of water have to be added regularly as evaporation does take its toll over time. One also has to worry about treating the water often as algae builds up and introducing the right quantities of chemicals. Then, one has to worry about maintaining the right temperature to keep it comfortable for swimming. As if these didn’t sound like an ache already, there’s the debris-magnet phenomenon that pools have. They draw in bugs, leaves, and other random garbage; the list continues—and if there are little kids around, there’s an added concern. For pool homeowners, all of this may sound like a throbbing routine; while it may sound like too much to handle for the prospective pool homeowners. Nonetheless, everything good does come with a responsibility right? Looking around at the gadgets, appliances, equipment, devices; that make our day easier: one would infer that we do need something of the sort for pools. That’s just about what solar pool covers are, they make maintaining your pool less of an intrusive activity and give you added benefits. Temperature regulation: Depending on the region, pool temperature is either not a concern or a reason to lose some sleep. For those in the desert, southern climates, or tropics; it’s the former. While those with four seasons to boot, it’s the latter. Verifiable stats prove that evaporation accounts for 70% of energy (temperature/heat) loss from pools (both indoor and outdoor). In more technical terms, each pound of 80ºF (26.7ºC) water that evaporates takes a whopping 1,048 BTU of heat out of the pool. What might you make of this? Replenishing the energy loss using electricity and gas solutions add up significantly to your bills, but solar pool covers have been estimated to save you 50-70% of this cost. In addition to saving you money, solar pool covers do extend swimming times—up to a month on either end of the swimming season—as they are able to raise the pool temperature by about 5ºF for every 12 hours of coverage. Reducing water loss: When the pool water evaporates, you lose a lot of water. Water loss is contributed by the following prevalent factors: air temperature, wind/ventilation & humidity. Solar pool covers reduce water loss drastically, conserving water and reducing your water bill in the process. In addition, it saves your time and cuts on the stress it’d take for you to hose up the depleted water level. Conserving chemicals: Treating your pool is essential for maintenance and usage reasons. However, the nonstop loss and replenishment of water panned on the evaporation of chemicals, mean that chemicals have to be added quite often. This also adds to the pool’s maintenance cost. A solar pool cover however, does ensure that chemical depletion is cut back, there are cost-savings and your pool is adequately maintained. Keeping the pool clean: A solar pool cover when spread out over the pool surface does keep debris out, keeping your pool clean when not in use and saving you lots of cleaning time. It can also serve as a “safety net” to stave off unintentional use of the pool. Solar pool covers, are thus a very if not the most important pool accessory one should have. 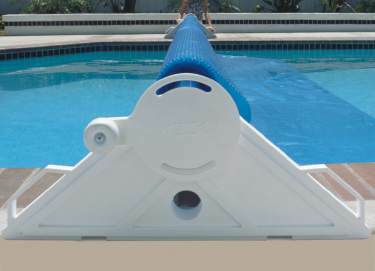 They are inexpensive, come in different sizes, material types and can be cut to fit any pool shape. They also come with a lengthy warranty period that’d mean more savings, and longevity of your pool. The best solar pool covers are those that have astonishing effectiveness at meeting these earmarked advantages, remain affordable and have a lengthy warranty period. Of the many solar pool covers out in the market, I have three top choices that I consider to be the best. I’ve had many pool owners give ecstatic reviews of them, I use one of them (it wasn’t an easy choice picking one over the other) and would recommend them without blinking. Moreover, it’s always great to have choices. The Swim Time Rectangular 12 mil solar blanket is a dedicated pool cover for those with an exceptional eye for quality. Riveting in its premium feel and reputation, it’s not difficult to see why there are so many who choose this over lots of pool covers in the market including myself. Design & Efficiency: Of many design elements, the transparency, choice of material and the inclusion of thermal bubbles gave me a keen indication of the quality of this solar pool cover. It took me only a month to realize how efficient it is (I’ve own this cover for 3 years now). I’ve literally pushed off the end of the swimming season to about 1 month (32 days was my longest stint), and have gotten realistically close to 15ºF temperature rise after days of use. It comes in different sizes and is UV-protected so it will last under intense sunlight. Price & Warranty: Depending on the size you need, the price varies. But the starting price is cheap compared to the alternatives. Beating that is tough, especially when its efficiency is factored in. This solar pool cover defines durability as it has a 5 year warranty tucked in. Click here to purchase at a great price! The Midwest 12 mil pool solar cover gives one great value for every bit of cash spent. It does have very detailed dimensions that go far in ensuring that its effectiveness is not compromised for being affordable. Its lightweight is a given as it ensures that the roll-overs are easier to do. Design & Efficiency: This 12 mil pool solar cover is blue and translucent, providing both aesthetic appeal and remarkable efficiency. As a result of its design, the pool cover permits solar heat into your pool while preventing heat from escaping. This is similar to a greenhouse and in so doing increases the pool temperature to as much as 12ºF which is no ordinary feat. It is also easy to cut into any shape of pool with a pair of scissors because of the choice of manufacturing material. Price & Warranty: Selling at a moderate price, the price point is way past affordable to the inexpensive price range. Couple that with the premium offering included, and you have a bargain that doubles as a recommended buy. For an extra $30, you will get a Complete Solar Reel Attachment Kit In-Ground Attachment Kit used to make the removal of the cover much more convenient. The best part of this deal is realizing that you are getting a pool cover with a 7 year warranty, which is the highest in the market. Available in several basic sizes, you have more than enough choices to make on which size would be right for your pool. For odd-shaped pools, taking the longest measurements of length and width is recommended. In addition to this, this pool cover is just about the most efficient out there. 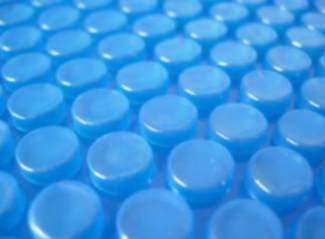 It ensures temperature rise, traps heat, cuts on evaporation and keeps the debris out; the combined effect of all this is having a terrific pool whenever the cover is rolled out. Design & Efficiency: Aptly designed to retain solar heat and cause temperature rise, this solar pool cover has all your cover needs sorted out. Going on, it cuts evaporation by up to 95%, keeps the pool cleaner by holding out dirt and debris—jointly leading you to save on chemicals as well as water. Its ability to preserve heat primarily spurns its 10ºF temperature rise efficiency. Price & Warranty: The possibility of getting a premier pool cover for a great price is next to impossible at the moment, making it highly recommended for purchase. Its durability is not a concern as it fits into the high end of warranty period (5 years). Often times, the maintenance of a pool appears to take so much that one energetically tries to justify owning a pool. This almost always ends up with blames passed on to the pool builders who abstrusely avoid the delicate issue of maintenance. If you’ve gotten to that point and still do not have a pool cover, then it’s about time you got one. For the immense benefits already outlined above, it’s bad economics not to get one of the recommended solar pool covers as a first time pool owner or a seasoned pool owner looking out for a replacement. These have been attested for by personal use, industry insiders and backed by hundreds of honest reviews. I like your information, solar pool covers are really beneficial for pool owners because it maintains temperature and also keeps it clean .